A first attempt to stack multiple shorter exposures to produce one simulated long exposure. 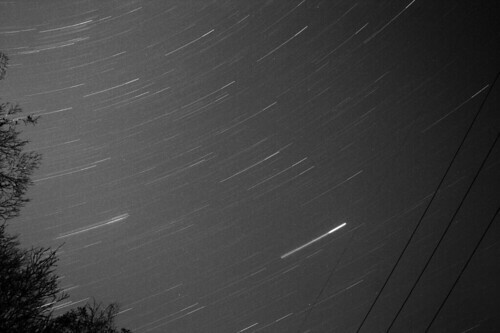 This is composed of 4 images, ~10 minutes each, f/7.1 ISO 400. Loaded each image in GIMP using Open as Layers and combined each layer using the Hard Light mode. It seemed to give me the best result. Switched the image to Grayscale mode and saved. The really bright streak is Jupiter. One of these days I'll make the effort to venture out to some place darker than my back yard.